The 100 baseT ethernet port can be configured as a client or server with a fixed IP address. It supports a gateway connection and has programmable keep-alive. All settings are configurable locally using the keyboard and display, and via ethernet. The RS232 port can be used for the connection of barcode scanner, printer etc. and supports bi-directional transfer. 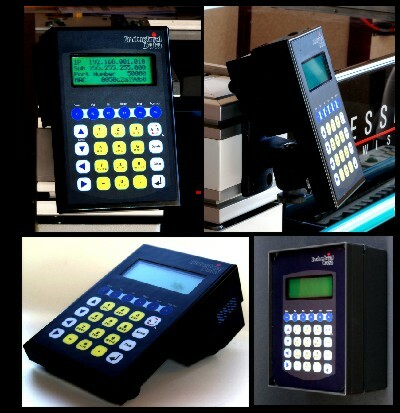 Can be supplied with RFID, Barcode or MagCard Swipe Reader. There are 2 relay outputs and 4 opto-isolated digital inputs. Each input counts at up to 250 cycles/second and measures cycle time. The status of each input, count value, and cycle time can be requested by the system or sent automatically. Convenient pluggable screw terminals are used for the plant terminations and standard sockets for the ethernet and RS232 ports. The power supply (between 10vdc and 30vdc) can be connected either by screw terminals or standard 2.1mm power socket. The mounting options include 2 sizes of ball-joint brackets.